ZoneFlex outdoor access points are ideal for hotels and resorts covering pool areas, for schools and stadiums covering sports facilities, and for general enterprises covering shipping docks and other outdoor areas where Ethernet cabling is not possible. Service providers can easily extend branded broadband services, offload bulky data traffic from congested 3G networks, deploy multimedia hotspots, or offer wireless DSL services where fixed line access is limited. 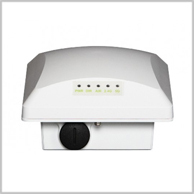 4Gon - your Ruckus Wi-Fi Outdoor distributor, supplier, reseller! Get all your wifi at 4Gon!